A man in Bihar married off his wife to his younger brother after they fell in love and vowed to stay together, officials and relatives said on Friday. He also handed over his two-year-old daughter to the newly-married couple before saying goodbye to his village and leaving for undisclosed location, witnesses said. The incident took place in Ghogha village in Bhagalpur district, some 250km east of Patna, on Thursday. The first-of-its-kind incident has now become the talk of the town. Reports said that Pawan Goswami, 30, married Priyanka four years ago. The couple led a happy married life and in due course had a daughter. The twist in the tale came two years when Priyanka realised she was in love with Pawan’s younger brother Sajan. Both Priyanka and Sajan vowed that they wanted to marry each other, despite all odds. Initially, the family members tried to convince them to reconsider their decision but they remained hell-bent on getting married. Eventually, Pawan agreed to the marriage, divorced Priyanka and arranged the wedding ceremonies for his wife and brother. Priyanka and Sajan solemnised their marriage at a local temple on Thursday in presence of several villagers. The temple administration also issued a certificate to the newly-wed couple, thereby validating the marriage. “I didn’t want to spoil their happiness and hence I decided to get them married. I am happy that my wife is now happy with my younger brother,” Pawan told Gulf News in a phone interview on Friday. He also handed over his two-year-old daughter to them, asking them to take care of her in his absence. Work done, Pawan left the village, sobbing inconsolably in public as local villagers tried to console him and requested him to visit the village. 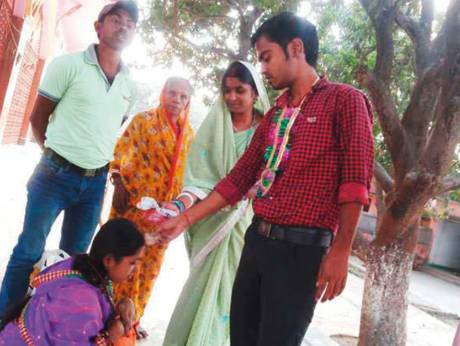 The incident, though, is in complete contrast to another such wedding solemnised early this week in Bihar where a teenaged boy ended his life by hanging from the roof just after the local court arranged his marriage with his widowed sister-in-law (wife of his dead brother) whom he considered as a mother figure. The wedding was solemnised on Monday, but he committed suicide in the evening as he was unhappy over the marriage.